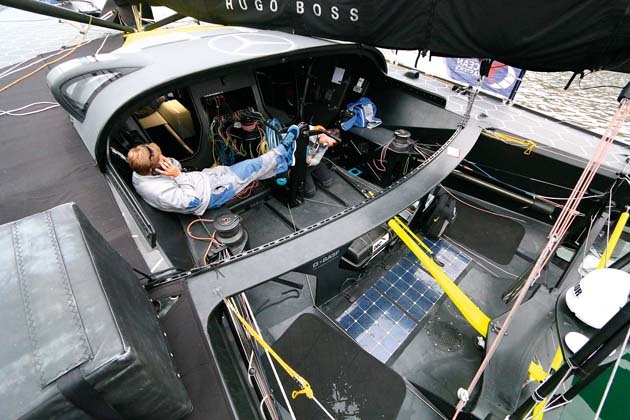 What’s behind the design of Alex Thomson’s Vendée Globe racer Hugo Boss? The 2016/7 Vendée Globe race will go down as one dominated by two very different sailors, Frenchman Armel Le Cléac’h and Briton Alex Thomson in two critically different yachts. There is no doubt that the foil-borne Hugo Boss is very fast in perhaps a wider range of downwind conditions, and development of this foiling technology will be at the forefront of designers’ minds as they work towards designs for the next monohull round the world races. But what exactly are the key features of Thomson’s black boat, and how does it work? For the design of Hugo Boss, Thomson and his team chose the race-winning partnership of VPLP and Guillaume Verdier, who have all but cornered the market in new IMOCA 60 designs. 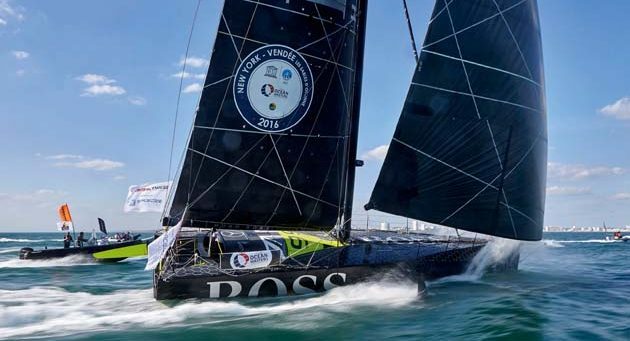 Like the five other new VPLP-Verdier designs, Hugo Boss is a semi-foiler, with giant and – frankly in her case – quite sinister-looking appendages protruding from either side that have been compared to ‘Dali’s moustache’ in the French press. The complex shape of these boards is because, just like on modern foiling catamarans, they must perform a dual role: their vertical surface creates lateral resistance to prevent leeway, while their horizontal surface provides upward lift beneath the hull, reducing wetted surface area and lift to leeward thereby increasing righting moment and stability. The result is a boat that does frequently ‘show keel’ and daylight beneath her hull an impressively long way aft and, in Hugo Boss’s case, in impressively little wind (ie with full main still hoisted). However, weighing around 7.5 tonnes and with no lifting surfaces on her rudders, she is no 60ft Moth. Nonetheless, just as is the case currently with the foiling multihulls, this development does represent one of the most significant performance boosts ever seen in monohull design. While other IMOCA foil-equipped yachts that started the same race, Safran, Banque Populaire and No Way Back, are the MkI of the new VPLP-Verdier designs and Edmond de Rothschild and St Michel-Virbac are MkII, Thomson refers to Hugo Boss as MkIII. She certainly has many differences from the others, most noticeably her giant foredeck chamfer. According to Thomson, Hugo Boss is also the narrowest of the new boats. “We made a call quite early on that the foils would work. If the foils are working and creating stability and lift then why do you need to have such a wide boat?” A narrower boat is also lighter, with less wetted area and lower drag, he argues. It should be pointed out that all the new generation semi-foilers are compromises – the teams are sticking a toe into the foiling world. The boats all still have massive beam and hull form stability, enabling them to revert back to more conventional daggerboards if required. 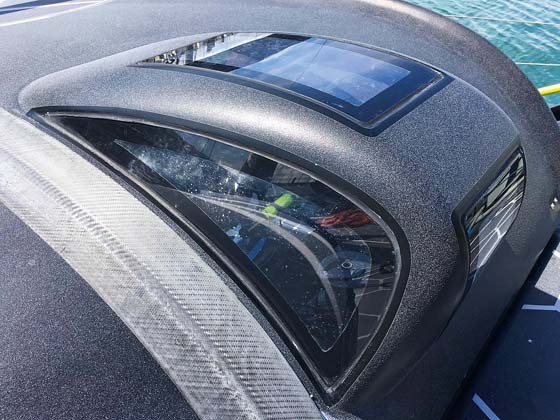 Apart from this technology becoming available, one reason these new foils have been fitted is the result of other constraints introduced to the IMOCA rule that have hampered performance. To contain costs and improve reliability, new boats must now be fitted with a one-design steel foil for their keel and a one-design rig, albeit in two types: wing or fixed. In fact, all the new boats have chosen the multihull-style 29m tall rotating wing, used in conjunction with deck spreaders that artificially widen the shroud base. Stability rules have also been rewritten, dispensing with the 30-year-old requirement that originally aimed to limit movable ballast by ensuring a boat at rest could heel no more than 10° with all her ballast deployed. As a result new generation 60s are no longer ‘water tankers’: water ballast tanks are now limited to four in total and, free of the 10° rule, these can be positioned over the chine for optimum effect – some older generation boats had more than 10 tanks, most positioned along the centreline. 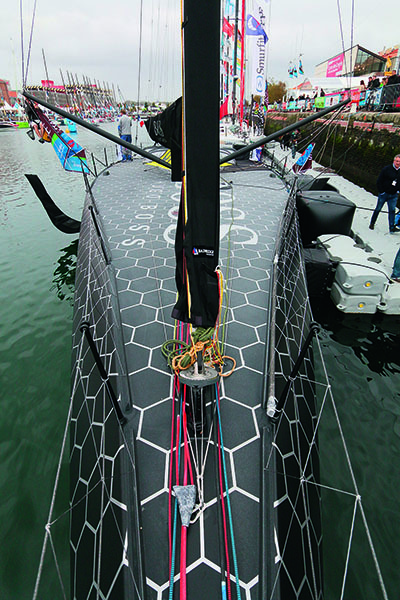 Typically new IMOCA 60s such as Hugo Boss now have around two tonnes of water ballast capacity as opposed to upwards of five. However, many skippers have been complaining that because they can no longer fit a forward ballast tank – which used to add some weight forward when sailing upwind or in a seaway – in some conditions the boats are horrific to live on. The motion caused by the foils and the noise from the monolithic carbon hull – the sandwich construction used previously had a sound-dampening effect – are quite unbearable. The speed of the boat on the foils Thomson describes as “obscene”: “I have been over 30 knots more than I have ever been before.” To date Hugo Boss’s top speed has maxed out at 35 knots, which only a few years ago would have been respectable on a multihull of this size. But apart from the motion, the fitting of the new-generation foils at present has significant downsides. 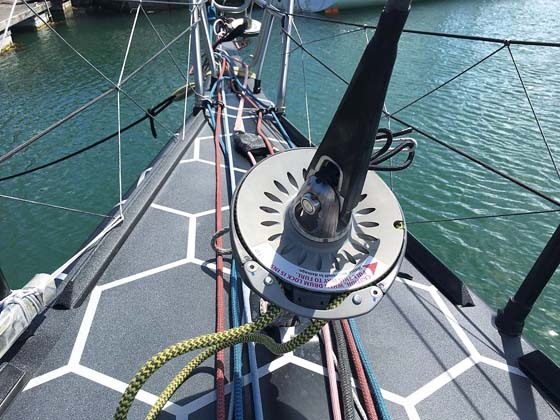 While canting keel IMOCA 60s used to perform poorly upwind because of their tiny daggerboards, by today’s standards, only a relatively small part of the new generation foils is used to prevent excessive leeway. 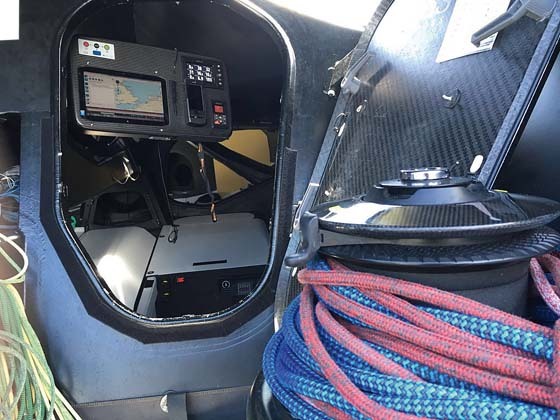 At present the new-generation IMOCA 60s such as Hugo Boss are optimised for the Vendée Globe and its predominant reaching and running conditions. The next step will be to improve their all-round performance. 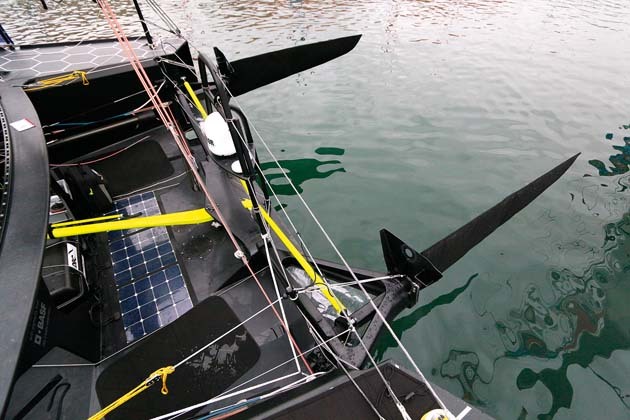 Now that the foils have apparently been embraced by the IMOCA teams, their big development will come over the next cycle in time for the 2020 race. 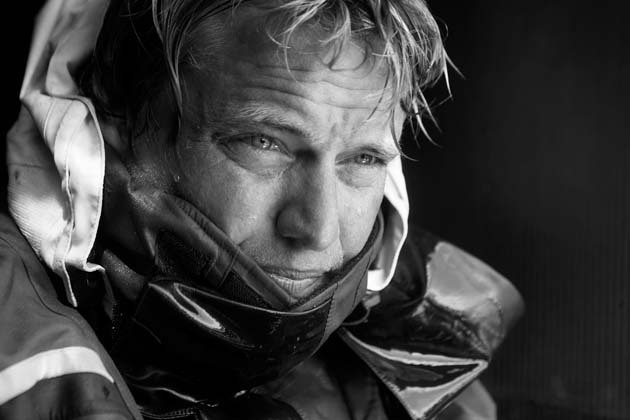 Gosport resident Alex Thomson, 42, first reached public attention when he became the youngest skipper ever to win a round the world race, coming first in the 1998-99 Clipper Round the World Race. Crewing for him was one Keith Mills, who has been Thomson’s mentor and backer ever since his move into the IMOCA class in 2003. This year’s Vendée Globe will be Thomson’s fourth, after he retired from his first two – in 2004 with damage to the deck, in 2008 following a collision soon after the start – but finished a very respectable 3rd in an older generation boat in 2012. Other high-profile incidents include his mid-ocean rescue by Mike Golding in the 2006 Velux 5 Oceans, and the abandonment of Hugo Boss after the boat was rolled by a rogue wave in November 2015. However, he has had major successes, including a 2nd place in the double-handed Barcelona World Race in 2007 and 2nd in the 2011 Transat Jaques Vabre. Like PRB, Hugo Boss has a forward-looking cockpit window. A ‘targa top’ roof may also be rolled over in poor conditions to protect more of the cockpit. The cockpit is extremely deep, offering great security for Thomson, while also lowering its centre of gravity. The roof can be retracted in better conditions. The gullwing foredecks of the last generation MACIF and Banque Populaire have gone. But Hugo Boss is alone in having a massive deck chamfer forward. This reduces weight and encourages the bow to emerge from waves more readily. The only hydraulics on board are used for canting the keel. Although there are halyard locks, the headsail tacks are cranked on via block and tackle. The paint on deck was developed by BASF and is novel in reflecting rather than absorbing heat – ie it remains cooler underfoot. 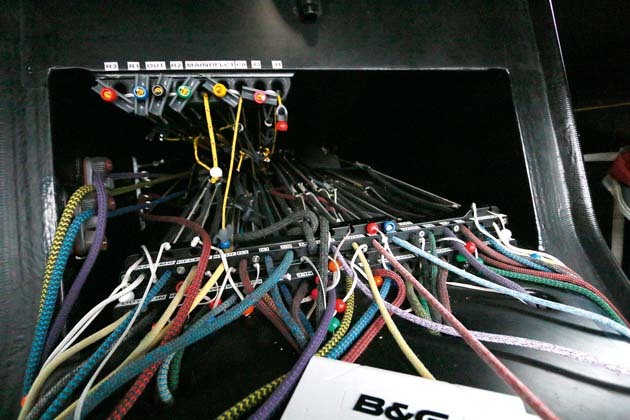 Hugo Boss has the now common twin companionway arrangement allowing the pit to be located in between. Watertight companionway doors are mandatory.